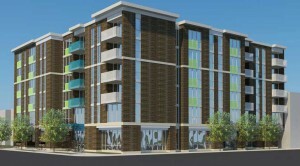 Artist rendering of the Cicero and George Elderly Housing Development. Courtesy Weese Langley Weese. The Hispanic Housing Development Corporation broke ground on the Cicero and George Elderly Housing development last Friday. “We appreciate all of you coming out on this cold day,” said Paul Roldan, CEO of the HHDC, talking to the crowd of about 70 people gathered at 4800 W. George. Currently an empty lot, once completed the site will be home to a six-story, 70-unit senior housing development. About 61 of those units will be for people with incomes between 30 to 60 percent of the area median income, while eight units will be provided to seniors at or below 80 percent of the area median income. One unit will be set aside for the maintenance employee’s apartment. The project is expected to cost over $20 million and create 96 temporary construction jobs over the next year. “We have about six different sources of financing. That’s the challenge. It’s not only one piece but many pieces from different sources,” Roldan told EXTRA. In total, about $4 million of the project’s funding will come from the Belmont Cicero TIF district while additional financing will come from Bank of America, Federal Home Loan Bank, Illinois Clean Energy Foundation, JP Morgan Chase, Local Initiatives Support Corp. and Wintrust Bank. The project has been in the works for the past three years and in order to open by next year, construction crews will pour concrete during one of the worst times of the year: Chicago’s winter. Yet, that isn’t the biggest challenge facing the development. “An issue we have with each and every single development we do is that the demand far outstrips what we can provide,” said Roldan. An example he gave was the five-story, 72-unit development the HHDC is about to open at the corner of North Avenue and Pulaski Road in Humboldt Park. The $24 million development is expected to have 68 of its rental units reserved for seniors who earn up to 80 percent of the area median income. It’ll also have 12 condo units for sale. The HHDC received $4 million in TIF money, $1 million in low-income housing tax credits and a $3.5-million loan from the city to help complete the Humboldt Park project. Mayor Rahm Emanuel and 31st Ward Ald. Ray Suarez, both running for re-election in February, were on hand to break ground on the Belmont Cragin project with Roldan and other community leaders. “This is the first time that a Hispanic housing company designed a building that doesn’t look like a typical senior building. This was designed with a lot of pride,” said Suarez, who’s also the city’s vice mayor. The alderman also hopes that once completed, HHDC’s building will serve as an anchor to motivate additional development into the community, which has had a recent influx of residents from Humboldt Park and Logan Square’s trendier areas. To address this trend, Suarez said he was trying to build as much affordable housing as possible in his community. Once finished, the new development will be near the city’s Department of Aging satellite senior center, which includes a massage therapy room, computer lab and a fitness center. The application process for residents wanting to move into the Belmont Cragin development is expected to begin next fall.